More than 41,000 people across 106 villages are reaping the benefits resulting from renewable energy mini-grids supported by the Rockefeller Foundation’s SPRD program, Jaideep Mukherji, Chief Executive, Smart Power India tells ETEnergyWorld in an interview. Edited excerpts..
Do you think the draft National Energy Policy (NEP) places enough focus on promoting clean energy sources? The draft NEP offers a progressive vision on how India proposes to meet its growing energy demand. We are heartened to see the emphasis placed on clean energy sources and the measures proposed to integrate increased capacity with the conventional system. The draft expects non-fossil fuel based energy sources to contribute to over 40% of our overall electricity mix by 2030 to help meet India’s reduced emission targets. We are pursuing a national target of 175 GW by 2022, and the draft NEP predicts a significant growth to reach about 700 GW by 2040. What are the areas where intervention is required for a rapid growth of RE solutions in rural electrification? We see a significant thrust on rural electrification in the draft NEP with the NITI Aayog acknowledging that India has ‘still to go a long way on securing its energy access objective’. It pegs the figure of Indians without access to electricity at 304 million. It is heartening to note that the draft NEP recognizes a need to redefine the concept of ‘electrification’ with the village being deemed completely electrified if all households have an electricity connection, which witnesses reliable supply of electricity at least for a set number of hours. The draft NEP also acknowledges how lack of access to electricity in homes, especially in rural India, impacts education, health and economic development. It recognizes the role that renewable energy solutions, especially mini-grids, can play in ensuring reliable and faster energy access to underserved rural areas and last-mile customers who are yet to be connected to the grid. Do you think states still have a lot of ground to cover on rural electrification? How can RE-based off-grid solutions help meet this challenge? We need to understand why rural electrification continues to pose a huge challenge for the government, despite the progress made in surpassing power generation targets. There are serious challenges – given that rural electricity supply and service costs are prohibitively high, while rural demand density is low and fragmented. Pilferage and losses reported are also high, resulting in revenues being well below cost of delivery. In such a scenario, DISCOMS, which are already under severe debt burden, have little incentive to improve rural access. The challenge is so large that a portfolio of approaches need to be tested and deployed. New models of electricity distribution are emerging. In nearly 106 villages across Uttar Pradesh, Bihar and Jharkhand, more than 41,000 people have access to reliable grid-quality electricity from privately operated renewable energy mini-grids supported by the Rockefeller Foundation’s Smart Power for Rural Development program. The draft NEP has also stressed the need to incentivize the mini-grid sector by encouraging independent developers and supporting them to scale. How does this model work and what is the current footprint and reach of the project? 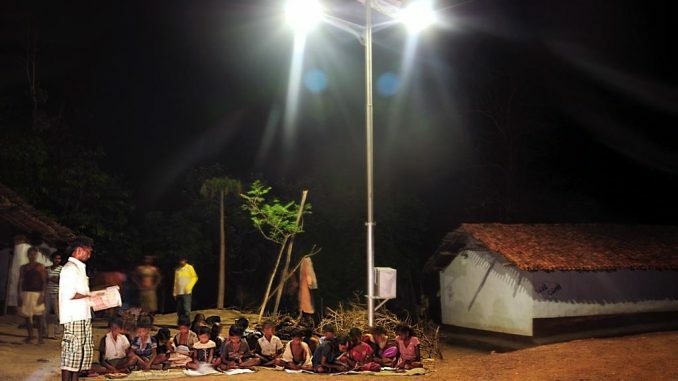 Over the last two years, Smart Power India (SPI), which implements the Rockefeller Foundation’s Smart Power for Rural Development (SPRD) initiative, has been trying to address the rural energy access problem in India. We work with private energy service companies, investors, NGOs, and the Indian government towards achieving this goal. SPI currently supports 106 renewable energy mini-grids across three Indian states, UP, Bihar and Jharkhand. Our mini-grids are delivering energy to homes and enterprises. Together with our seven energy services partners, we are providing reliable power to nearly 12,000 households and rural businesses. We are also in the process of building 125 new mini-grids with our partners. How do you evaluate the integration of mini-grids with the national powergrid in India? The draft NEP shows the government is cognizant of the role mini-grids can play in accelerating rural electrification targets. We are encouraged by the positive developments in UP and Bihar – both these states have announced dedicated mini-grid policies. Bihar has also set a substantive target of 100 MW to be achieved through mini-grids. The state policies provide guidelines and explore options for mini-grids to interact with the national grid. We would like to continue working with the government to explore partnership models with state discoms to provide proof of concept on interactivity. We believe more private players can be attracted to scale up mini-grid deployment if the government announces a national target for mini-grids along with a package of incentives. We look forward to the announcement of the national mini grid policy, which is currently under discussion at the Ministry of New and Renewable Energy. We have previously seen examples of how privatizing electricity distribution has proved successful in some Indian metros in improving quality, reliability, collection and loss reduction. Such public-private partnerships forged in rural electrification can unleash innovative business models, new technologies and operational efficiencies for a breakthrough in bridging India’s rural energy access gap. What have been the measurable socio-economic impacts of electricity at the villages you have connected? We have noticed an increase in income generation activities in the 106 villages where our mini-grids are operational. Assured power has helped improve living conditions. Our energy service companies are seeing an increase in the rural demand for mini-grid power. Small businesses and enterprises are coming up in these villages. New micro enterprises that use electricity – tailoring units, RO water plants, rice hulling units – are increasing. Thanks to longer operational hours and higher productivity, small businesses have reported an increase in monthly income.